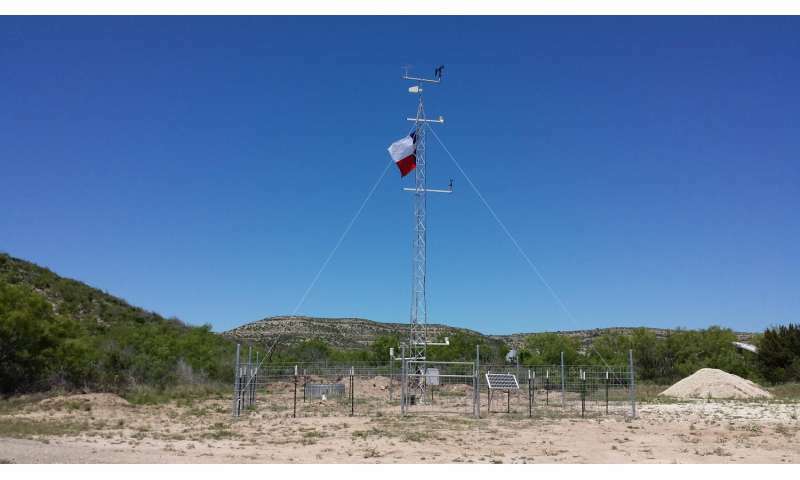 This mesonet site in Throckmorton County, halfway between Wichita Falls and Abilene, Texas, automatically monitors the weather in the area. Credit: Wes Burgett, Texas Tech University National Wind Institute. Are you a farmer who wants to keep better track of the climate conditions around you? There's an app for that. A group from the USDA Agricultural Research Station (ARS) has introduced a web-based application to help. It allows users to access important historical information about the past climate in their area. This could allow them to better plan for the current year. "We wanted to make an application that addresses some of the most basic questions that producers tend to ask about the current year's weather," explains Steven Mauget of ARS. "How does this year's rainfall or growing degree days compare with recent years? Are soil conditions warm enough to plant? When does first freeze usually occur in my area?" The data in the application comes from mesonet weather stations . A mesonet is a network of weather stations placed at a certain distance from each other—usually about 20 miles apart. These closely-spaced stations shed light on local weather features associated with thunderstorms and gust fronts. The web application can be used by anyone interested in the data, such as farmers, certified crop advisers, and extension agents. It mainly covers the ten-county area surrounding the city of Lubbock, TX. It also covers the Rolling Plains to the east of the city. "These weather features occur over 'mesoscale' spatial scales," Mauget says. "They are kind of midway between small scale features like dust devils and storm clouds and larger scale features like the low and high pressure systems that might extend across many states." 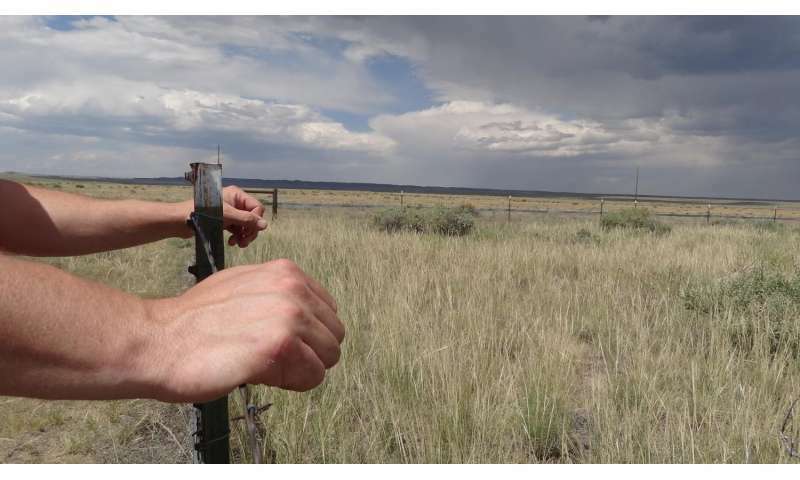 In most regions, the spatial separation of stations in normal weather networks are too far apart to detect these weather events that are important to farmers and ranchers, he adds. Farmers depend on local weather conditions for planting and harvesting decisions. Consulting localized weather data, gathered over years, can help. Credit: Neng Iong Chan (2015 ASA Photo Contest). The web application presents data from the previous ten years. Mauget says that traditionally, people study climate over longer periods, such as thirty years. More recently however, as climate is changing in some regions, it can be defined in periods as short as ten years. The new tool provides important information such as soil temperature, cumulative growing degree days, and cumulative precipitation. It also gives first freeze dates and cumulative freeze hours, among other data. In West Texas, the leading crop is cotton and it can't be planted until the soil is warm enough. This makes the soil temperature important. Growing degree days help producers predict crop development. Knowing when the first freeze is going to hit or how many hours temperatures will be below freezing is also helpful for farmers needing to harvest a crop. The web application will provide this information from the past ten years, too. "On a year-to-year basis farming can be kind of a seat-of-the-pants affair," Mauget says. "The general idea was that by comparing the development of this year's conditions with those of the past ten years, producers might be able to get a better intuitive feel for how the current year might play out weather-wise and yield-wise." While the information doesn't technically forecast or predict upcoming weather, the application was designed to be potentially useful over the course of a growing season. It does this by allowing comparisons over the years. Producers access the information on a secure web browser on a computer. The researchers hope to expand their web application to include more areas of the state and the country. However, funds and resources are significant barriers as gathering this kind of data can be expensive. "I think this work shows a way that mesonet data can be used as an applied climate resource," he says. "As water becomes less abundant in Texas aquifers, farmers are becoming more dependent on rainfall so it's important for them to have more knowledge about their growing environment."